Fast Snake Removal - Call 407-956-1268 any time of the day, and we will discuss your snake problem & schedule a same-day or next-day appointment. I deal with snakes on an almost daily basis, and have been working with this nuisance animal for 7 years. I do not perform snake extermination. Rather, I am a humane snake trapper company, and I prefer to use live trapping and relocation, or exclusion. I catch snakes by hand, and I also perform snake prevention services for yards and properties. The best way to achieve effective snake control is to understand the animal and its behavior, and establish the appropriate course of action given the property and matter at hand. Snakes are not bad animals, but they are common in urban areas, Orlando included of course, and I excel at solving snake problems quickly, professionally, and effectively. I aim for permanent results, to keep those snakes away for good! Snakes in Florida - Florida has a variety of habitats and thus has a variety of snakes. Florida is currently experiencing a huge issue with pythons in the Everglades national park. These snakes are not native to Florida, and are the result of years of escaped and released pets. In the year 2000, park officials confirmed that a group of pythons was breeding within the park boundaries. Recent surveys have shown an alarming decrease in mammalian activity since the python boom. Raccoons and rabbits have been severely depleted, and larger animals like deer are dwindling in number. The pythons have no natural predators within the park, and Florida animals are not used to encountering such a sizeable predator. The snakes can grow to be large enough to take on an alligator, the current animal at the top of the Everglades food chain. Scientists fear that the pythons will move on to endangered species, like the Florida panther. The drop in raccoons means less predation on turtles, snakes, and alligator young. 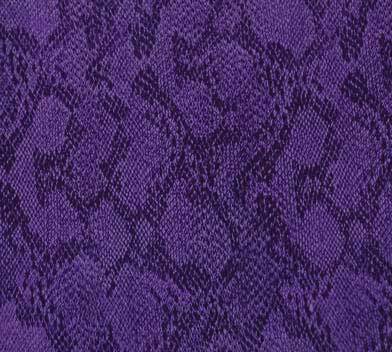 Without predation, these reptiles will flourish. It is expected that the mammalian population will remain depressed, and that the pythons have caused irreparable damage. All snakes have some small teeth, to grip prey, but Garter Snakes such as the one pictured do not have fangs. Venomous snakes are very rare - ignorant snake killing is very common. That's just the way it is. Learn more about Orlando reptiles, including About the Green Anole. 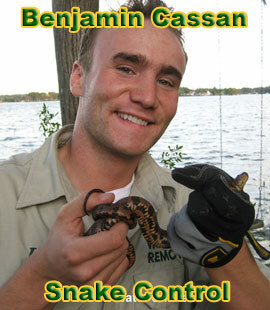 If you have any snake questions or comments, e-mail info@cassanwildlife.com or better yet, please call 407-956-1268 and I will answer.